Christmas Season is just around the corner. Looking at magazines and blogs I am amazed every year anew at all the creative activities. Personally, I'm a late starter when it comes to Christmas preparations (I fill the Advent calendars for my boys usually in the night of November 30th to December 1st!) But... 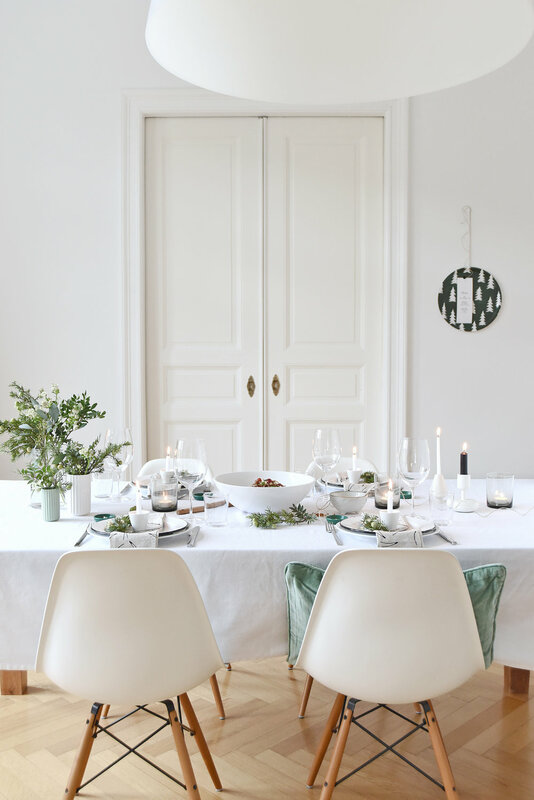 I'm totally ready for an almost winterly table covered in green, white and natural shades right now - no need to wait for a little holiday preview on my tabletop. I went with a fir tree theme as I like the beautiful forest designs of the Swedish brand Fine Little Day so much! Their cute tray was used toput my menu card on the wall and give my guests an overview of dinner. If you want to try this yourself, just attach a poster-hanger on the backside of a tray and make sure the hanger holds the weight. In keeping with the theme, my flower vases hold a variety of branches. Have a look in your favorite flower shop or at the farmers' market for coniferous sprigs other than the traditional ones and mix them together. I found branches of Juniper and added Seeded Eucalyptus and white Lesser Masterwort for a little floral accent. In addition I made four fine circles out of black aluminum wire and tied some very small sprigs. It doesn't have to be a whole wreath to make an impact! Tiny candle arrangements took a seat in the middle of my "half wreaths". All you need are plain egg cups, Christmas tree candles and wax dots to fix the candles (just never leave candles unattended). You can find a step-by-step DIY showing how to add flowers to a circle in the book Decorate With Flowers (under Coat Hanger Wreath) - you can download the book from Amazon right here. As a starter I served Red Quinoa & Grape Salad with Almonds from the "What Katie Ate on the Weekend" book. Such a treat! I could have it every day! Your guests will love it. How about you? Are you at the ready for Christmas with all its glitter and sparkle or still enjoying everything autumnal? Should you have any questions about this post, please leave your question in the comments section below in German or English. Have a beautiful start in the festive season and see you again in December! - Anke.